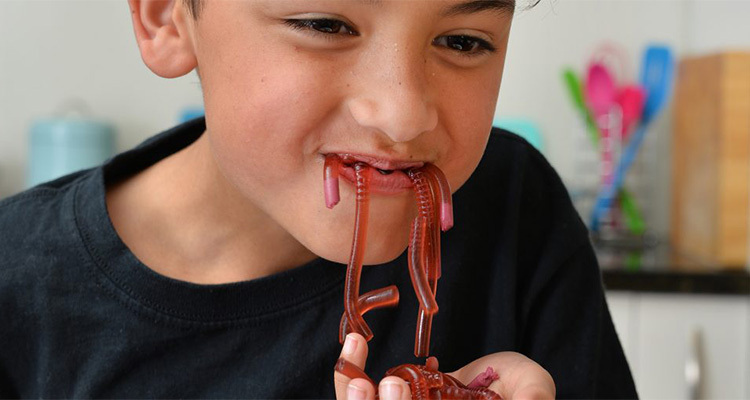 Using the power of crosslinking, these realistic looking worms not only look amazingly disgusting – they also taste great! Carefully pour the boiling water into a large jug and add the jelly/jelloand thegelatin, stirring until dissolved. Carefully pour the mixture over the top of the straws, filling each straw. Refrigerate for4 hours. Jelly/jello wobbles because it contains gelatin, a coiled up protein chain that unravels and floats around as strands when hot water is added. As the water cools down, the gelatin strands coil back up and become tangled with each other, trapping the fluid they are in and transforming the liquid into a solid structure. This process of gelatin strands becoming tangled with each other is called crosslinking. Because the worms have a high aspect ratio – meaning they are long and thin – they need to be stiffened to help them keep their shape. Adding the extra gelatin causes more crosslinking to occur, with the chains making the structure firmer and stiffer when set. Jelly/jello is usually transparent – or see through – but the additional protein and fat molecules from the cream deflect and scatter the light so that the worms become opaque. 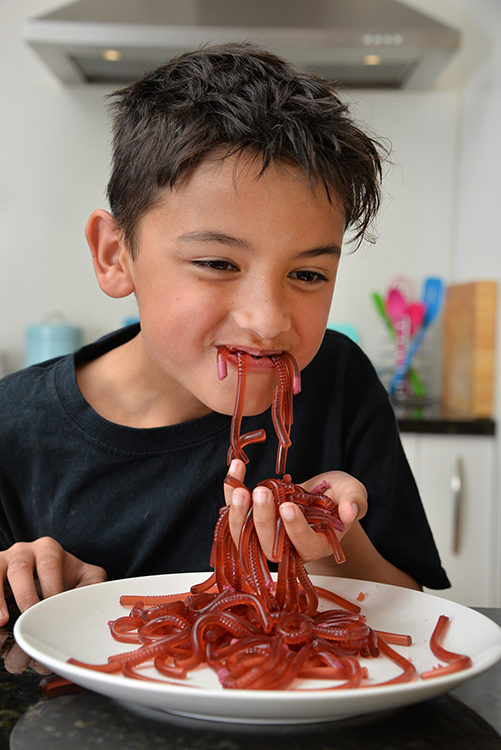 Mixing red jelly/jello and green food colouring makes the worms a ‘realistic’ brown colour – but you can, of course, make them any colour you like. » Do the worms look different if you do not add cream to the mixture? » What happens if you do not rinse the straws in warm water before squeezing out the worms? » Why do you think the warm water helps? Try to bend the boneagain, andsee how much easier it is than before. Bones are made up of a mixture of hard minerals and tough, flexible proteins like collagen. It is this combination which makes bones not only strong, but also able to flex without shattering. Calcium is a mineral which helps to give bone its strength. This is why babies need a lot of calcium-rich milk to strengthen their bones as they grow. Vinegar is an acidic liquid which is strong enough to dissolve the calcium out of the bone and make it less stiff. With more collagen than calcium, the bone goes from feeling hard and stiff to soft and rubbery. The relationship between structure and properties is very important to engineers and is essential in the design of structures that are both strong and lightweight, just like bone. » Does the experiment work with other acids – such as lemon juice or fizzy soft drink? 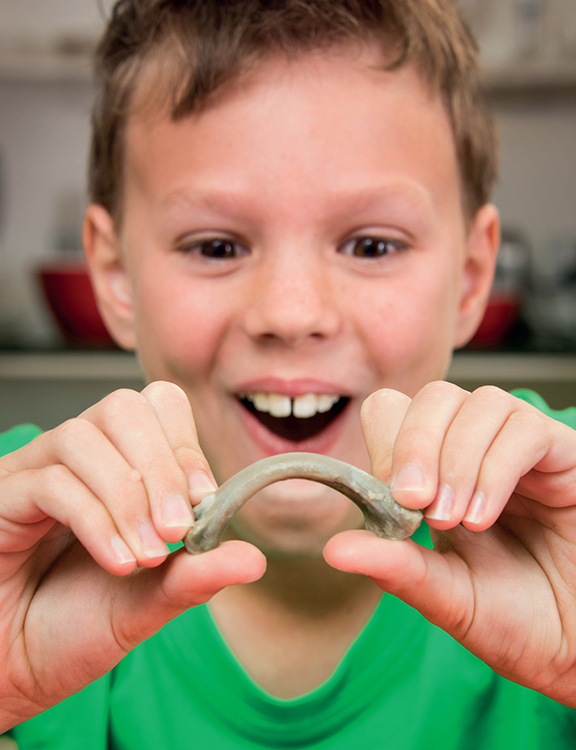 » Do you think the size of the bone affects the time taken for the calcium to dissolve? » Would immersing the bone in a calcium rich fluid – such as milk – make it stronger? thanks to the power of dishwashing liquid which breaks up the surface tension of milk. Pour enough milk onto the plate to cover the bottom. 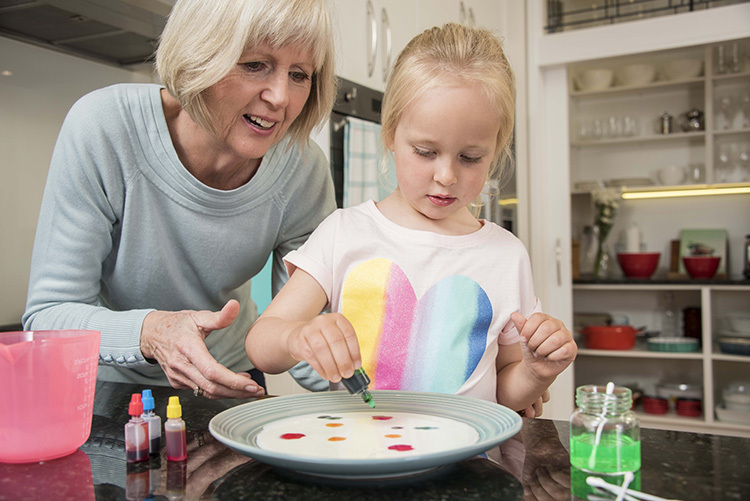 Carefully add a few drops of food colouring onto the surface of the milk. Repeat using different colours, creating a polka dot effect on the surface of themilk. Note how the food colouring floats. Dip a cotton bud into the dishwashing liquid, then hold it in the centre of the plate,keeping it as still as you can. Watch as the food colouring swirls around, creating moving art. Dip the cotton bud into the dishwashing liquid again and touch it onto a differentarea of the plate. Repeat until the colours stop swirling. Milk is mostly made up of water, but it also contains proteins and fat. Because oil and water do not mix, the fat is stored as tiny droplets which float in the milk. The poured milk holds itself together on the plate using a property called surface tension, which is where the cohesive or sticking forces of the molecules in the milk stick together. When drops of food colouring are added to milk, they can be seen to float on the surface rather than sinking to the bottom. This is because food colouring is less dense than milk. Dishwashing liquid, designed to break up the grease and fat on dishes to clean them, can also break up fat molecules in milk. The dishwashing liquid breaks the surface tension. The tension across the surface pulls the milk surface away from the break caused by the soapy cotton bud – a bit like when a balloon bursts. As the food colouring is floating on top of the milk it moves with the surface, floating away from the drop of soap and allowing the flow pathways in the milk to be seen. As the soap becomes evenly mixed with the milk, the flow slows down – but all it takes is the addition of another drop of soap to start the process again. » What happens if you use other dairy products, such as cream, with more fat content? » Is the flow pattern the same if you use two drops of dishwashing liquid in different places on the milk? » Does the temperature of the milk change the flow rate, and if so why? Recipes from The Kitchen Science Cookbook by Dr Michelle Dickinson. 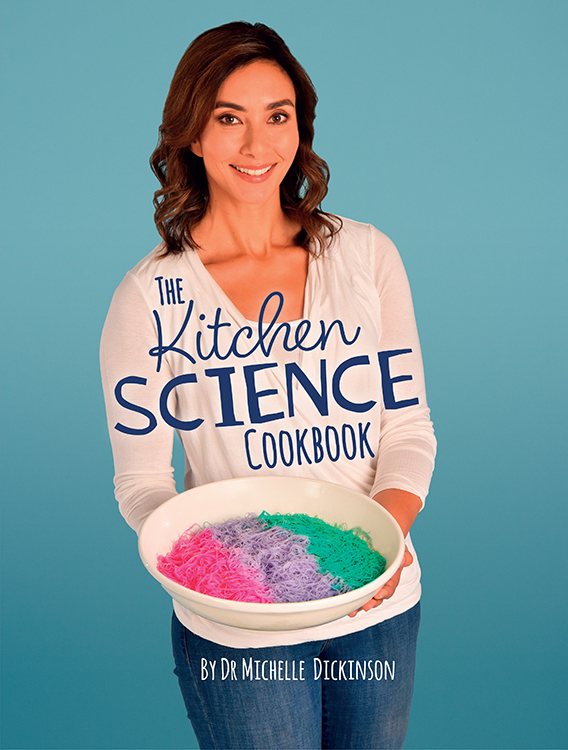 The Kitchen Science Cookbook is packed full of fun ‘recipes’, each teaching an important scientific principle in a format that is perfect for parents and children to enjoy together. Available on Amazon. ?